Putting up with chronic headaches, difficulties with biting and chewing, and other symptoms connected to TMJ dysfunction (TMD) can make your life needlessly difficult. Your Allen, TX dentist’s office can explain how these issues can be connected to problems with your jaw joints, and how a custom appliance can help put a stop to your problems. Our practice can also make sure you have an appliance that protects you against nightly teeth grinding, a problem known as bruxism. Treating bruxism promptly can be especially important, because this problem can eventually lead to serious dental damage if it is not stopped in time. Problems with your jaw joints can result because of unaddressed problems with your bite function, because of chronic stress, or due to a physical injury that affects the alignment of your joints. 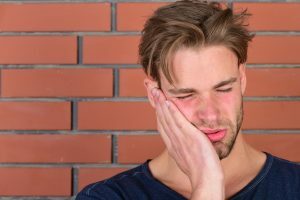 These problems, known as TMD, can make your daily life unpleasant because of the many aches and pains they create, and because they can cause you to grind your teeth while you sleep. Your dentist can check for signs you are struggling with TMD during a routine dental appointment, or you can reach out to schedule a visit if you think the problem is impacting your life. Reducing the pressure on your jaw joints can help you return to a life without the persistent pain caused by TMD. The appliance is worn at night – when in place, it can relax your jaw, and reduce the pressure your joints feel. You can also rely on a custom appliance to keep your teeth from grinding. If nothing is done to protect your smile against bruxism, the damage can become severe enough to require restorative dental work. If you keep up with regular dental exams, you receive more than just warnings about tooth decay, and regular dental cleanings. You also enjoy intervention when your dentist identifies any other troubles that affect you. This can help you avoid periods of prolonged discomfort, and it means your dentist can keep you informed about problems you should be wary of, like TMD. Allen Family Dental is proud to protect patients from the effects of TMD and bruxism. Treating these issues is just a part of the many services we make available to residents in and around Allen, TX. Our practice can also help you with a range of restorative, cosmetic, and preventive services. To arrange your consultation with Dr. Torrens-Parker or Dr. Lizardi, call Allen Family Dental in Allen, TX, today at (469) 342-6644.